Manila Symphony Orchestra (MSO) begins their 2012 Concert Series with Violinist Regina Buenaventura performing on July 6 at the Francisco Santiago Hall, BDO Corporate Center in Makati, and on July 7 at the Philam Life Auditorium in Manila. Arturo Molina is conducting for both shows at 8pm. MSO brings to life an exciting and colorful dreamworld bursting with vibrant music, where ambition and fantasy become a reality as the orchestra performs Dukas' The Sorcerer's Apprentice, Kodaly's Hary Janos, and Barber's Violin Concerto, featuring violinist Regina Buenaventura. The Sorcerer's Apprentice is one of the most extensively performed of all of French composer Paul Dukas' works and was made popular to moviegoers of all ages by its appearance in Walt Disney's animated classic, Fantasia. The symphonic poem is based on Goethe's poem which tells the now-familiar story of a young apprentice who, when left alone by his master, casts an enchantment on a broom to do the work for him. Zoltan Kodály's Háry János is a comedic Hungarian folk opera. In the opera, Hary, a soldier, begins telling exaggerated tales of his heroism that become, to him, a reality. With Kodaly's music, we enter into a Quixotic fantasy wherein the flawed hero's illusions of grandeur become a reality. Samuel Barber's Violin Concerto is one of the most frequently played of all 20th-century concertos, and is known for its finale which demands technical skill, virtuosity and energetic passion from its soloist. 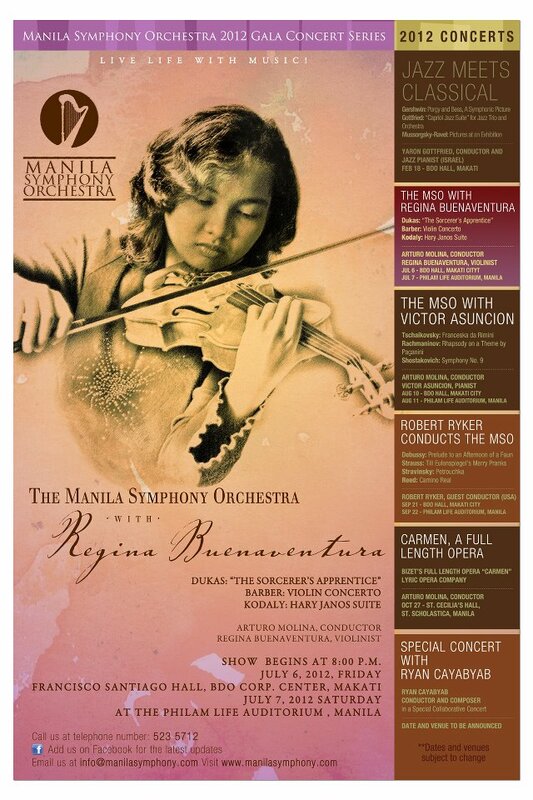 Taking on the challenge of Barber's concerto is Regina Buenaventura, a young Filipina violinist with a deep and mature understanding of her music. She has been featured as solo artist in concerts in the Philippines and the United States, including the George Bush Presidential Library Concert. Growing up in a musical family, Regina is the granddaughter of National Artist for Music Col. Antonino Buenaventura. Through her years of study and performance, however, she has started to make her own name for herself in the music scene. Currently based in the US, Regina studies under the tutelage of Professor Almita Vamos at the Northwestern University of Evaston, Illinois, where she is a recipient of the prestigious Merit Scholarship award.